The Duck with no Quack. This is my first book. I wrote, illustrated and self-published. The book appeals to young children (3-5 years). 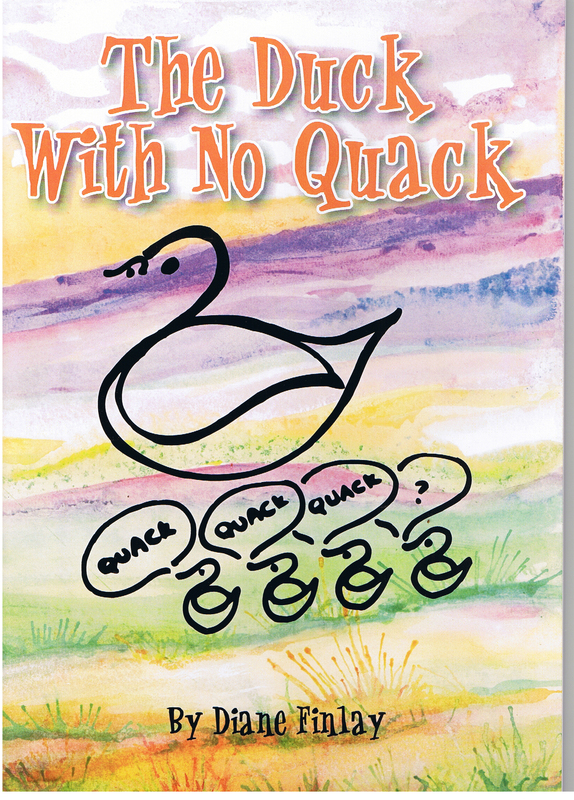 This is the the story of Oswald, a duckling, who seems to have lost his quack. As his Mama proudly shows off her ducklings to the other farmyard animals she listens closely to Oswald hoping to hear him quack. Whilst her ducklings sleep she searches the barn – no quack. However it is Oswald himself who finds his quack. For sales contact me on: findpublishing@hotmail.com. The book retails at $12.95 with a discount for bulk purchases. Most of my children’s short stories are food related. I have a wonderful class of children and two brilliant teachers at Whitfield State School in Cairns to thank for the inspiration. I was asked to give a creative writing workshop on healthy eating. The children produced some highly imaginative stories and poems but it also inspired me to write a selection of funny foody stories. I’ll add more stories once I am able to give the publishing credits because some of my stories have been accepted by NSW Schools magazine. Watch out in August for Jaspers Problem. This story is the feature story in the August edition of Orbitmagazine and I’m very excited about that. Arthur got excited. “If carrots are good for your eyes it means I could get rid of my jam-jar bottom glasses,” he said to himself. Arthur’s mum was delighted he’d started to eat his carrots. “I want carrots for school, carrots for dinner and I want carrot juice for breakfast.” Arthur wanted carrots with everything. Arthur began to notice changes after he’d been on carrots for a week. He’d turned a delicate shade of yellow and one or two of the hairs right on the very top of his head had turned bright green. A few weeks later, now quite orange and with a gorgeous mop of green hair, Arthur was having difficulty walking. His legs had fused together from the top of his thighs down to his knees: his toes had disappeared and his arms felt shorter. Arthur’s mum’s delight at her son eating a vegetable had turned to despair. Her little boy was becoming a carrot. “What shall I do?” she asked granny. Granny asked her neighbour: the neighbour went to the doctor and the doctor came running. “Can you cure him?” asked granny. Arthur lay in his hospital bed, bright orange and carroty – a colourful contrast to the crisp white sheets. Arthur was a carrot. A carrot with jam-jar bottom glasses. I’m looking at my problem. It’s a really big problem and it’s getting bigger all the time. “Twenty-three peas up one nose!” she’d yelled getting into the car. I waved and wondered what sort of operation Dr. Millar would do. A Pea-ectomy, perhaps. Would he put the peas in a little jar and let Maisie bring them home? I hoped not because then she’d take them into class for ‘Show and Tell’ which would only give her another opportunity to boast. What is it with little sisters? Maisie is always doing stuff like this. She’s so embarrassing. Two weeks ago she tried out a marble experiment on dad’s car exhaust. He rattled, crackled and shot marbles for days. Pudding copped the first one – poor thing. Mum said it had been very hard explaining the injury to the vet. Last weeks experiment was the worst… Suddenly I remembered I was supposed to be looking after Grandad. He’s so forgetful now he could’ve been anywhere but I found him in the lounge room trying to flick channels on the T.V. “Here let me help,” I said taking Maisie’s toy mobile phone from him and swapping it for the remote control I found in his pocket. Maisie had helped Grandad and painted the buttons with nail varnish. “So he’s colour coded,” she’d said in that snotty little sister voice of hers. It didn’t help because he forgets which colour to use anyway. “Thanks Joshua,” he said. I sighed. Anyway last weeks experiment involved Grandad and his motorized wheel chair. None of us realized you could make it go that fast or that it was even capable of wheelies. Funny how it’s never her fault. And the wheel chair repairman is still confused. Grandad was okay about it though. He was a bit shaky when we finally stopped it and helped him off. He thought he’d been out on his motorbike. When Dad’s home Maisie is his little angel but when he’s out flying his plane or in the office working with his eyes closed we have to put up with things like pea experiments. Anyway, Grandad was happy, Maisie and Mum were at the hospital and I was bored. I sat on the back step and thought what Dad would say. He’d say I should consider my options. I didn’t have any – I had to stay home to look after Grandad. Suddenly I had a brilliant idea. “I know, I can look after Grandad and make pizza at the same time.” I jumped up – excited. “Mum needs my help – Maisie is such a handful.” I said as I walked into the kitchen. And this is where my problem begins. I’d made pizza with Mum hundreds of times and I was sure I could remember what to do. The ingredients were easy: flour, salt, yeast, warm water and a slosh of olive oil. I could hear Mum’s voice inside my head, Learn to cook without measuring, Jasper. Trust your best guess, then it doesn’t matter if you don’t have a set of scales. I got everything together and started. This is where I think I got it wrong. I couldn’t remember if it was one sachet of yeast or one box. I opened a sachet. I poured and poured all twelve sachets of yeast into the warm water and left it. I went to check on Grandad. He was sleeping – his gardening programme always does that to him. I lifted Pudding off the budgie’s cage then went back to the kitchen. “Wow,” I squealed, “that’s awesome!” I hadn’t remembered yeast ever frothing all over the kitchen bench like a volcano, but I wanted to help Mum, so I poured on some oil. I knew I had to mix it with the flour to make dough, cover it and leave it in a warm place until it doubled its size. …Well, it’s later now and I’m looking at my problem, looking at my pizza dough. It has definitely doubled in size in fact it’s probably a hundred times bigger. It’s taken over the kitchen and is oozing squidgely through the doorway into the lounge room like a huge, puffy, billowing doona. I panic. If I don’t do something Grandad will be…. “Grandad!” I shout as I run, “wake up: wake up please. I’ve got to get you out of here.” I’m really panicking now – running around the lounge room like a hamster in a wheel. The dough is already half way across the floor. I have to rescue Grandad, get him out of the house or he’ll be swallowed up and we’ll lose him forever, and it will be my fault and I’ll never hear the last of it from Maisie. I dash around the room. I spot the gardening programme. Suddenly I have an idea – I know what I have to do. “Jasper to the rescue,” I say bravely as I shoot out of the house to the shed to get what I need and race back. “Grandad, wake up, I have to move you,” I say: throwing Pudding and lots of cushions into the wheel barrow. Grandad’s woozy but finally I get him comfortable. Just in time – the dough changes into a pizza monster and starts to eat the back of his chair. “Phew.” I don’t know how I get Grandad, Pudding and the wheel barrow out of the house, but I do – I save them. Grandad wakes up when I park him under the big tree in the front yard and says, “The colours are really good today. It almost feels like I’m actually there. This must be what they mean by reality T.V.” Then he’s off to sleep again – but I still have my problem. I have to get the pizza monster out of the house. I run into the lounge room with the hose and begin the fight. I feel like a Superhero. The monster begins to shrivel and shrink under the power of the water jet. “Yahoo – its working!” I am a conquering hero – the fight goes on. I try different moves, new angles. I stab and jab with the jet – I cut and thrust: then like a Jedi Knight I twist and jump. The pizza monster is shrinking, retreating from the power of the force. I raise my arm ready to strike the final savage blow…. I’m confused: she’s not supposed to be here. I do a double take. I realise where I am and what I’m doing. My breathing is hard and fast and loud in my head. I gulp to calm down. I really hate it when she sneaks up like that and spoils things for me – right when I was about to make the kill!. I still feel pretty pleased with myself because I’ve cornered the monster in the veggie patch. Suddenly the water changes from a jet to a dribble. I drop the hose and run to the tap: I run smack into Mum. “No, I had to use the hose to get the pizza monster out of the house!” I take hold of Mum’s hand and pull her ‘round the house to show her what I mean. I can’t believe what I see. The pizza monster is huge, blowing up in the warm sun like a hot air balloon and it’s swallowing the shed. “Pizza dough!” She looks like she’s going to explode. If she explodes and the pizza dough keeps growing how will I explain it all to Dad when he comes out of the office? I’m panicking…again. I could hear Dad’s voice inside my head, consider your options. “We need to consider our options, Mum,” I say, feeling brave. “That’s what Dad always says.” This doesn’t help and Mum gets even closer to detonation. “Okay,” she says, “now I understand,” and she sort of crumples. First published by NSW Department of Education and Training in ORBIT magazine – August 2011. Here’s another story also published by those wonderful people at NSW Department of Education and Training. I’m in my veggie patch talking to my tomatoes. It makes them happy and they grow better – that’s what Uncle Bob says anyway and he should know: his tomatoes are brilliant. He’s coming over today. Me and Uncle Bob have an agreement. We did the whole thing properly: he spat on his hand, told me to do the same then we shook hands. He said that made us partners and we could trade and do proper deals. I like that because Dad and Uncle Bob trade all the time – horse poo for a bag of grain, or three chooks for a piglet but Uncle Bob and me trade duck eggs for seeds. Dorothy tries to nip my hand as I lift out four eggs and put them into Uncle Bob’s hands. I head off to look for dad; he’ll be in the shed with the tractor. I stand in the doorway peering into the cool, dusty, darkness waiting for my eyes to work in the dim light. I see his shape under the tractor, the light in his hand making weird shadows on the walls and floor. I think he means Mum when he says people can’t be replaced. Mum died last year – so it’s just me and Dad. He’s sees me and slides out from under the tractor. I like Sunday’s – Dad always makes sure we spend the afternoon together. Sometimes we stay on the property and sometimes we go over to see Uncle Bob and Aunty Pat but we never go into town anymore – not since Mum died. It wasn’t like that when Mum was here … We used to go into town nearly every weekend. There was always something happening. Mum let me spend my pocket money on whatever I wanted. Now I’ve got all this money saved and no where to spend it. Another thing it gave me the chance to get out of jeans, t-shirt and gumboots. Mum would always do my hair and I’d wear one of my pretty dresses – none of them fit now – I’ve grown. “Yup,” I say wiping snot and tears with my sleeve. I have a big corner of the home paddock to myself. I love growing things – I’m good at it. At school I ask Mrs. Robinson, the librarian, to help me find books – she even bought a book ‘specially for me. It’s a reference book. I can use it to take notes, then try things out at home. She got me a book on small animals as well. Jemima is my brown speckled hen. I have Liquorice, Toffee, Jelly Bean and Honey – my guinea pigs and Dorothy my duck. I have a joey. Dad found Ralphy by the road – his Mum was dead – she’d been hit by a car. I knew how Ralphy felt and dad said I could keep him but I have a hard time stopping him getting into the veggie patch. I plant and water my beans, pack the picnic and meet up with dad. There’s always stuff to do on the farm. While Dad milks the cows I cook dinner and sort out my stuff for school. I like school. I like the chatter and the giggling on the bus. I like my teacher Miss Angela; Uncle Bob is her dad and she gives me bottles of nail varnish and perfume and shampoo and things like that from her sister’s beauty salon in town. Dad doesn’t know I have any of this stuff. I keep it hidden in my secret place. Dad threw out all of Mum’s things. I wanted to keep her gold locket so I could look at it and remember how she looked when she wore it. Dad pulls up at our favourite spot on the river. On the far side is a steep muddy bank, with deep fast flowing water where the boys jump in. This side of the river is part of our property and there are lots of big old gum trees right down to the waters edge: their branches stretch out over the rocks making cool, dark pools where the fish like to hide. We have our picnic sitting on the soft river sand then swim and play for a while. “Okay Eddy lets fish,” says Dad. I run to the ute and grab the gear. I like this time of day; the sun’s low in the sky and the water sparkles. Dad says the soft light makes the fish come to the surface. I watch the ripples and see a flash of silver. I like watching Dad, his hands are so big and rough but he ties the flies to the hooks and makes it look so easy. When I try my hands just get into knots. We sit till the light fades. Dad cooks up the fish till they’re brown and crisp, he lets me have some of his beer mixed with lemonade and we wipe up the fish juices with the bread crusts. I know in his own way he’s making up for not taking me into town. I close my eyes and smell the warm muddy earth, the gum trees, the cooked fish and the charred firewood. The birds are squabbling in the trees – Mum always used to say it was because they were arguing over which bedtime story they wanted. I stretch, grab the bucket, go to the river’s edge and get some water. The embers spit, sizzle and hiss: there’s a short burst of steam and the fire’s out. Uncle Bob only ever calls me Edwina when he’s got something important to say. We walk around the house to my veggie patch. Dad rubs his chin and pulls at his nose. Dad and Uncle Bob start arguing – I run to my secret place. The light is bright in my face. Dad meets me at the door. His face is wet. He hugs me tighter than he ever hugged me before then we’re both laughing and crying and it feels so good. The next week at school is the best, I tell everyone on the bus and everyone in my class I’m going in the show and Miss Angela says she’s booked an appointment for me to have my hair done too. I feel so good being part of the excitement again. Lots of kids at school are in the show, some with their veggies, some with flowers and some in the pet show. I think maybe next year I’ll enter the guinea pigs in the pet show – turns out Jelly Bean is a boy and that’s why Honey, Liquorice and Toffee are all so fat, they’re going to have babies. I’m going to have sooo many guinea pigs: I can’t wait. It’s Saturday and my tummy’s all knotted up. I didn’t sleep and I’m worried dad might change his mind and say I can’t go to town and my hands are sweaty but then I see Pat in her ute bouncing along the dirt track throwing up clouds of red dust. I wave. Aunty Pat squeezes my hand. Aunty Pat was right about it being a military operation. We’ve done one side of the high street – I got a beautiful dress and now we’re in the coffee shop. Some of my friends see me and tumble into the shop giggling. I smile, “Yes I’m in the veggie section.” It feels so good to say it. I’m so nervous now. I didn’t think I’d feel like this. I know my lima beans are the best but Josh’s pumpkin is awesome and Stevie’s cabbage is huge and very green and I think colour counts for a lot in the judging. I feel a tap on my shoulder. “Eddy, I want you to have this. I was saving it to give you when you were older, but you look so beautiful in that dress with your hair like that I think you need to wear it now.” Dad has tears in his eyes and his big fingers shake as he tries to fasten Mum’s gold locket around my neck. I hug Dad. My face is red and hot and I wish the judges would hurry up. There’s so much noise and so many hot sweaty bodies. Suddenly I’m being pushed from behind – it’s Aunty Pat. I trip onto the stage. The tent is hot and stuffy. I don’t know what to do. Then I see Dad next to Uncle Bob in the front row and they’re clapping and cheering – they look so silly. The judge helps me on to the podium, puts a crown on my head and I feel so proud. I hope Mum can see this. And here comes another one – I’m so happy the editors like my work. I think there’s something wrong with me. Everyone I know, everyone at school loves picnics especially beach picnics. People think I’m strange. I’m not strange. I’m just scared, but I can’t talk to anyone about this. I suppose it isn’t really the picnic. It’s all the stuff that goes with it – you know the ants, the wasps and the flies. Beach picnics are the worst because of the sand. I hate having sand in my sandwiches, but it always happens no matter how careful I am… Maybe that’s why they call them sandwiches. Everyone else laughs at their crunchy sandwiches – I just want to be sick! It doesn’t help. I know ants can get into your food. They can nip, they can even eat people. I watched this program on television once about giant ants that ate people. Mum said they were African ants, but that doesn’t help. What if they learn to travel and they come to Australia and they start eating Australians and I’m the only person left here. I’d be lonely and scared. I hope the ants stay in Africa. Then I saw this program about African killer bees. That got me really worried. I wondered if the bees made travel arrangements with the ants. I don’t ever want to go to Africa they have such scary creatures. Hasn’t he heard about Stonefish? But you see if we fall off the top of Australia we’ll land in the sea with the crocodiles. I don’t think my Dad has thought this through properly. Anyway back to the freshwater my Dad says is safe. I’ve been reading about Stonefish: they live in freshwater and if you accidentally stand on one they inject this poison into your foot and you have to get to a doctor really, really quickly. I wonder if there are doctors at the top of Australia or have they all fallen off and been eaten by the crocodiles? I have never let my imagination run away. Never, ever – I keep a really close watch on my imagination. If it ran away I might lose it. Then it might run all the way to the top of Australia and fall into the sea and be eaten by the crocodiles. I wonder what an imagination tastes like. Maybe it’s got sand in it and it’s crunchy and the crocodiles won’t like it …. Still on the vegetable theme and this one was accepted for publication too – I just don’t know when it will happen. or kiss a ‘blue’ berry? or get stuck in a strawberry jam? or discover plums have bums? or be mean to a nectarine? or wonder why this rhyme began?